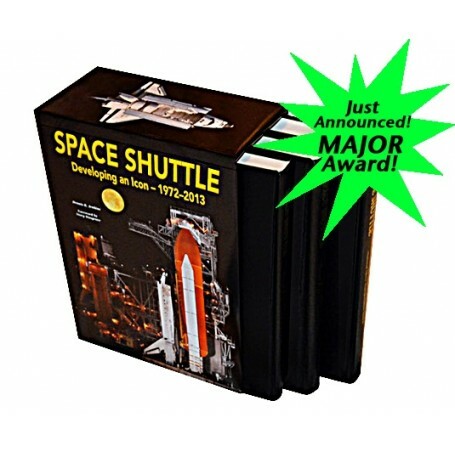 The complete US Space Shuttle program from the earliest days through the very end is documented in this three-volume set with slipcase that features 1,584 pages filled with over 1 million words and nearly 4,000 photos and line drawings. Due to this collection's heavy weight (18 lbs) non-standard shipping costs apply. See shopping cart for details. During 30 years and 135 missions, the U.S. space shuttle carried more crewmembers to orbit than all other launch systems, from all other countries combined, and carried more than 4.5 million pounds of payload to orbit. It was a staggering record of success. Unfortunately, it was accompanied by a tragic record of failure, with two accidents claiming the lives of 14 astronauts as well as other incidents claiming several ground personnel. But, as Richard Truly, an astronaut and NASA administrator, once said, "Flying in space is a bold business. We cannot print enough money to make it totally risk-free." This assertion was not meant as an excuse, simply a statement of fact regarding the physics of space travel and the dangers of chemical rockets. Because it flew for 30 years, most people alive today do not remember a time when the space shuttle was not in the news. The public was enthralled, the politicians somewhat less, and the armchair critics even less so. The space shuttle was meant as a stepping-stone to broader exploration. But the funding and political will never materialized, leaving the vehicle with little meaningful work for most of its flight campaign. Nevertheless, the space shuttle launched a variety of commercial and military satellites, planetary probes to Venus and Jupiter, and three of the four NASA Great Observatories, including the pi ce de r sistance, the Hubble Space Telescope. Only near the end was it able to demonstrate its intended purpose, building a space station. Even that, when finished, was only a shell of what had been envisioned when the space shuttle was approved. Unfortunately, having found its stride as the primary support vehicle for the International Space Station, the White House canceled the program, leaving the United States without the ability to launch people to orbit. All of this has left an uncertain legacy for one of the most visible engineering achievements of the 20th Century. This book is not meant to establish that legacy, but to thoroughly document the development, technology, and, to a lesser extent, the flight campaign. We will leave it to future historians to determine the ultimate worthiness of the program. What we can say for certain, though, is that it was one hell of a ride. 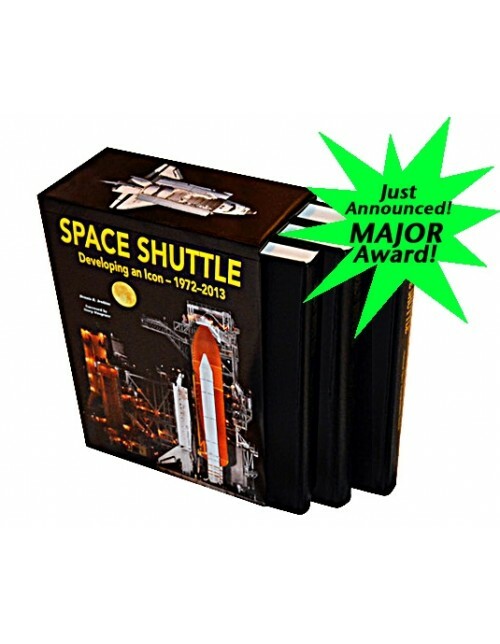 "This is arguably the most outstanding space publication of the century so far and it is very hard to see it being eclipsed. In more than a million words it is a fitting tribute to an iconic winged vehicle and is the most outstanding publication on this remarkable flying machine yet published." "Jenkins' latest--and finest--work is by far the best thing done on the Space Shuttle to date, and it will be difficult to match and, in my opinion, impossible to top in the future. This is one of those extremely rare cases where the importance of the task of matched by the author's ability to tell the true story from the insider's point of view." 2017 Combs Gates Award Winner! Winner of the 2017 National Aviation Hall of Fame Combs Gates Award! Winner of the 2018 AAS Ordway Award!